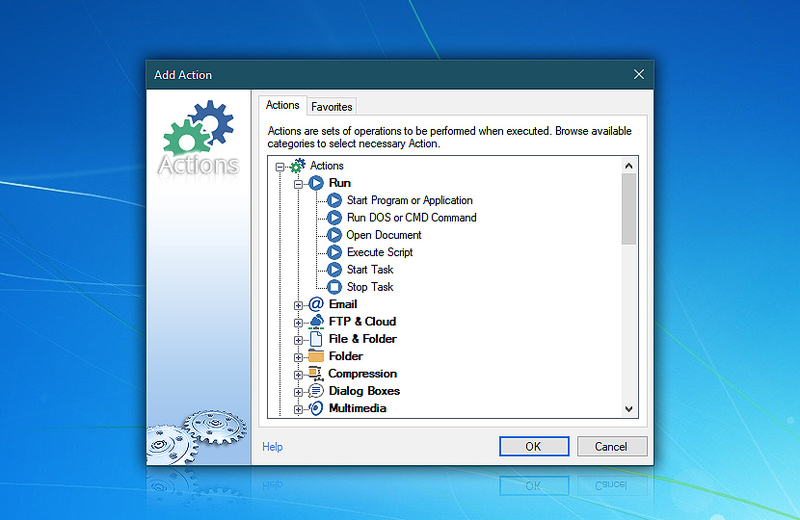 Add Action · dialog is used when adding new Actions to the Task. The Actions cover a wide range of operations and are conveniently grouped by their respective categories such as Run, Email, File / Folder, Compression, Dialog Boxes, Multimedia, Wait, Printing, Registry and Automation Workshop. Automation Workshop Free Edition works on all modern 32-bit and 64-bit Microsoft Windows versions · Windows 7 · Windows 8 & 8.1 · Windows 10 · Server 2008 & 2008 R2 · Server 2012 & 2012 R2 · Server 2016 · Server 2019. Copy linkCopy and paste the simple code into the HTML for your site. Thank you! Download now and start saving time with Automation Workshop Free Edition! We're growing fast. Thank you! Automation Workshop Free Edition v3.2.0. Automation Workshop Free Edition v3.1.0 now fully supports Windows Server 2019. Includes many UX and UI improvements. Automation Workshop Free Edition v3.0.0 introduces 18 new Actions in 4 categories. Numerous Action, UI and usability improvements. Automation Workshop is an awesome piece of software — love the intuitiveness, flexibility and simplicity. —Howard C.
Copyright © 2001–2019 · Febooti Ltd.